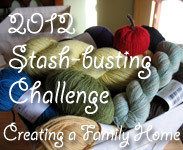 This week, I actually have more of a variety, as I am trying new things to make the best use of my stash. 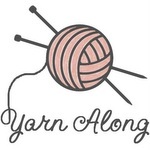 Confession: I love sock yarns. They come in such a wide range of colors, are nearly always machine wash and dry, and the skeins come in a size perfect for a quick project. 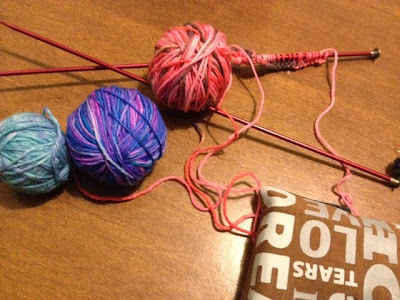 Problem: I don't knit socks. I mainly crochet shawls and scarves, with a tiny bit of knitting thrown into the mix. So this new project is a bit out of my zone of comfort. I've started the Sock Yarn Blankie. So far, I'm going no where near the speed that the designer, Shelly Kang, says she went (20- 30 minutes per square), but I'm finding a small, extremely portable project something I need right now. And there is the more instant gratification part of the project too. I can knit one small square and still feel mostly accomplished. My selection of sock yarns at 6 am. I'm not neglecting the crocheting front in any way, I'm just at the awkward, non-portable point of my current hooking project. My sister's birthday gift needs to be finished before the weekend, and I'm hoping to finish tonight after I get out of work. I'm really loving the Stroll for this project- extremely squishable! (See also-- I'm using sock yarn for crocheting. Again!) 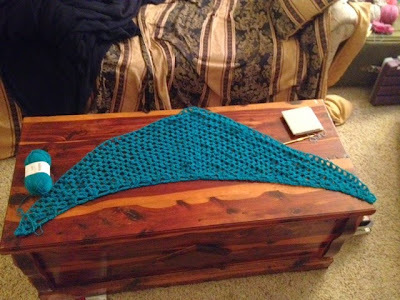 And the color really fits the name of the shawl- Shallow Waters. This really is one of my favorite shawl patterns- a soothing repetitive pattern, with excitement at the end with the border. My sister is more petite than I am, so I'm thinking only one or two more rows before moving on to the border. She will definitely wear this as a scarf too, so I dont need to worry about making it bigger for shawl purposes. My younger sister's birthday is tomorrow, but due to drive time, work, appointments, and Holy Week services, I am not going to see her until Easter Sunday. Even though I hope to finish tonight, I do have a bit more wiggle room with this project. I'm still reading the Scott Hahn book from last week, as it is written to be read in bite-sized chunks. There is still the hope that I can find a good novel to read, but it would probably be better if I wait until summer. On the moving front, my husband installed the new gas stove this weekend, so we are nearly at the point where the new apartment is livable. Also, all the old, junky, left-behind furniture has been removed, so we can really start to move in as we want to. The next few months will definitely be a time of slowly transferring the winter clothes, the unused books, and similar things out of our old apartment and into the new one. I will be grateful to be out of the old one, especially since we have a deadline (the lease expiring) for this move. Any later moves will be as gradual as the first-- slowly moving things to a new place (hopefully, God-willing, a new home) from the current place. Sock yarn is my weakness too. But I do love to knit socks. We need to get you knitting socks! They are so easy - especially if you skip the whole heel part and make tube socks. Beautiful colours of sock yarn - I don't knit socks either. Hope your move goes well. I started a sock yarn blanket a looooong time ago, I really should work on it! Sock yarn is so addicting! There's tons to make with it besides socks if you search Ravelry! It's also perfectly fine to just stack it all and pet it while saying "my precious....."